It is my truly great delight to attend today's reception. I feel honoured to have this opportunity to show my respect and regard for Lord Howe. Since I came to work in London five years ago, I have met Lord Howe many times on different occasions. I have benefited a great deal from his insight and vision. · And I think of a symbol of friendship between China and Britain. Lord Howe is a revered senior statesman. · He has served in the Palace of Westminster for 51 years and has held many important public offices. · He has been, successively, the Minister of State for Trade and Consumer Affairs, Chancellor of the Exchequer, Secretary of Foreign and Commonwealth Affairs, Leader of the House of Commons and Deputy Prime Minister. · Following his retirement as an MP, Lord Howe has served in the House of Lords for 23 years. I cannot think of any other public figure in contemporary British politics who has given such dedicated and distinguished public service as long as Lord Howe. In China, we would describe someone who has given such a long and great commitment as "an evergreen and never-aging pine tree". Lord Howe is also a man of immense wisdom. He has participated in and contributed to the solution of the most complex issue between China and the UK – the handover of Hong Kong. After assuming the office of Foreign Secretary in 1983, Lord Howe became directly involved in the negotiations between China and the UK over Hong Kong. Lord Howe showed great courage and wisdom in those negotiations, and worked creatively with Chinese leaders. Together, they reached the Sino-British Joint Declaration and cleared away the biggest obstacle to the development of China-UK relations. The Joint Declaration laid a solid foundation for the smooth handover of Hong Kong in 1997. Not only that. The Joint Declaration has also set an example for solving historical issues between states. Today, the principle of "One Country, Two Systems" remains the bedrock of stability and prosperity in Hong Kong. All of these speak volumes about Lord Howe's historic contribution to China-UK relations. But above all, Lord Howe is a great friend of the Chinese people. 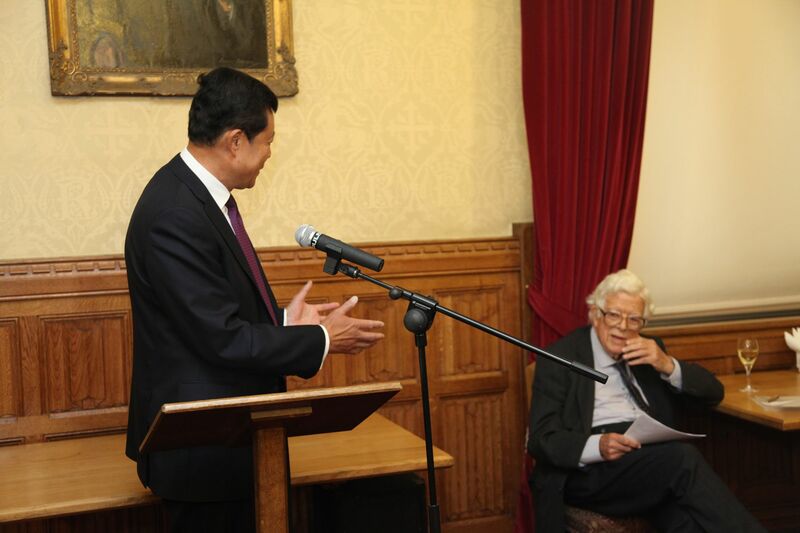 · Lord Howe has lived through many significant events in China-UK relations. · He has made friends and worked closely with generations of Chinese leaders. 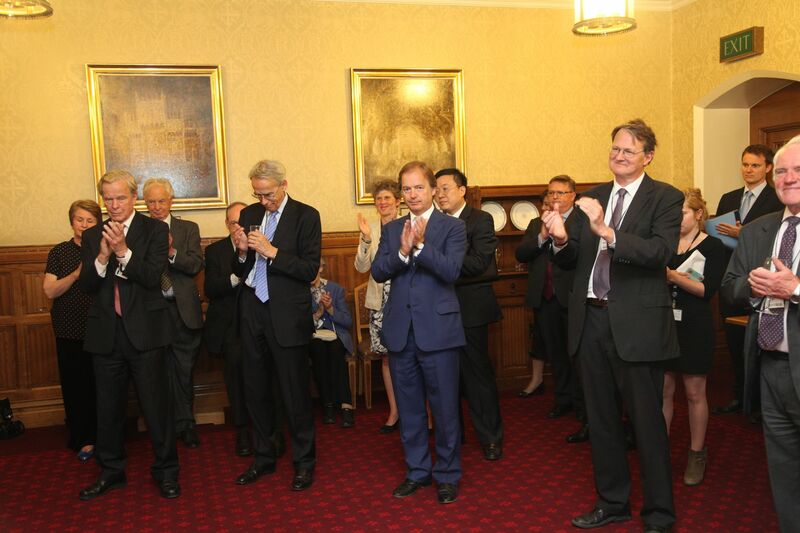 · To his Chinese friends, Lord Howe has always been a highly respected British statesman. For 23 years Lord Howe has served as Honorary President of the Great Britain China Centre. In this role, Lord Howe has been working relentlessly to promote exchanges between political parties, the judiciaries and the young people of our two countries. Through his wisdom and leadership, Lord Howe has contributed tremendously to advance political mutual trust and friendship between the peoples of China and the UK. Under his guidance, the GBCC has served as a bridge of communication and cooperation between our nations. 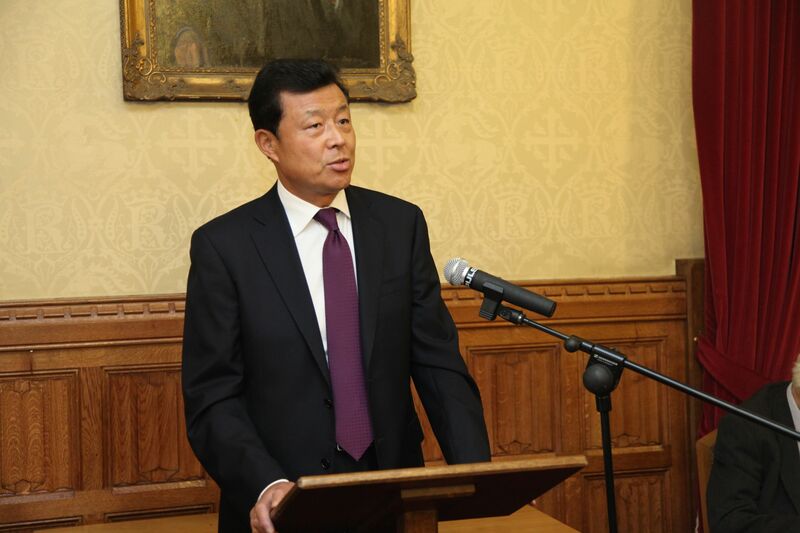 It will play an even greater and more important role in promoting China-UK relations. "A mature steed in the stable still aspires to gallop a thousand miles! And a mature hero still cherishes high aspirations!" There can't be a more apt description than this! At 90, and retiring from the House of Lords and GBCC, Lord Howe remains hale and hearty, and as vigorous as ever! Lord Howe, I hope you will continue to care for and support China-UK relations. In that spirit I know you will continue to inspire and encourage the younger generations. Your great wisdom can rouse the youth of today to follow your lead with so many years of dedication. China-UK relationship today is faced with significant opportunities. President Xi Jinping will pay a state visit to the UK in October at the invitation of Her Majesty The Queen. We are ready to work with the Palace, the UK Government, the Parliament and various communities for the success of the visit. We should make this visit a new milestone and usher in a "golden time" for China-UK relations. I am sure that is what Lord Howe wants most for China-UK relations. That is also our best way of paying respect to Lord Howe.